Efforts to refill Lake Delton have reached the halfway point. Water has been returning to the popular tourist attraction since December, and lake levels are expected to be back to normal in the next few months. 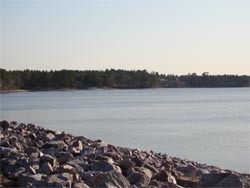 Melanie Platt-Gibson, with the Wisconsin Dells Visitor and Convention Bureau , says the lake is now 50-percent full, and is on track to be back to normal by the Memorial Day weekend. A breach in the shoreline last summer caused almost all of the water to drain from Lake Delton, largely devastating the many resorts and businesses that rely on the lake. Platt-Gibson says there&apos;s a great deal of anticipation from area businesses for the lake to be restored. She says interest continues to grow as the water goes up, with many businesses already reporting an increase in bookings for the summer months.